The creator of aerial yoga is Christopher Harrison. He develops certain exercises, which make your body stronger and provide it with elasticity. Consider the following aerial yoga tips and find out whether you may include it in your workout plan or not. We can’t regard aerial yoga just a classic yoga program. It is closely connected with Pilates and calisthenics. Aerial acrobatics also makes a part of it. The great advantage of this aerial yoga is that you may combine various yoga positions. For instance, you may go for the ‘car cow’ with ‘chandelier’. If you decide to perform this type of yoga at your home, you are recommended keeping your stomach empty, as your digestion may suffer greatly, when the hammock begins pressuring. As for your outfits, you should pair your long shirt with long pants, in order not to let the hammock go into your skin. Thus, your body will be protected and you will have fun while doing aerial yoga at home. Consider also one more important fact: be calm, without any anxiety and try to keep you in a good mood in order to avoid any mistakes during the performance of aerial yoga. Besides, your trainer will recommend you the necessary types of exercises. Aerial yoga has many beneficial qualities. It is great both for your body and for brain. It has a toning feature for your body. Due to its redefining character, your body will be stronger and you will be able to get rid of backache. In addition, the aerial yoga will improve your mind and intelligence. It will also get rid of cellulite. Your self-assurance will be improved and you will feel great. Aerial yoga is great for blood pressure and digestion process. Besides, it fights against age. 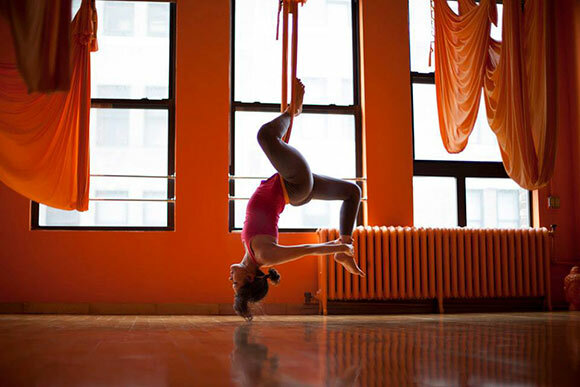 You are probably interested what to expect while doing aerial yoga. First, you should not be afraid of the hammock, as it is proved that this tool is able to hold up approximately 970kg. Thus, you should not be preoccupied with this thought. Besides, this great tool is secured on the ceiling with special equipment for climbing mountain. Thus, get rid of the fear from your heart and do your useful exercises. The Restorative Yoga is one of the techniques of the aerial yoga. It will focus on your spinal muscles and make your body fit and strong. Moreover, this type of exercise helps you experiment with various heights and makes all your spinal muscles work. Thus, take into account these aerial yoga tips and include this splendid yoga type in your workout plan. This entry was posted in Fitness and tagged diet tips, fitness tips, workout tips, yoga.